Summary: I show a scripting technique to assign display formats to loaded data without touching existing load statements. 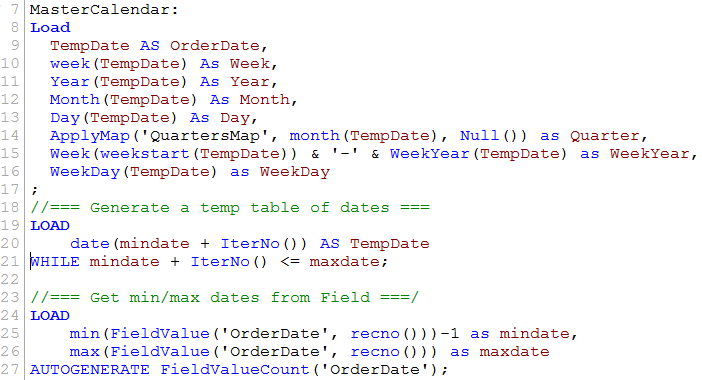 I coded in SAS for many years and always appreciated the FORMAT statement which allows assigning a display format to a field, independent of loading the field. 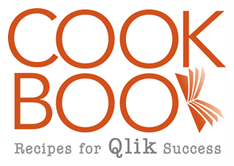 In QlikView and Qlik Sense script, there is an equivalent that is useful to be aware of. It’s not a statement, but a little known trick (so little known I’ve never seen anyone but me do it, although I’m sure others have thought if it). It maintains the optimized QVD load. I can include a master list in the TempFormatTable. There is no error if a field doesn’t exist in the QVD. I don’t touch the existing Load statement. I don’t always format this way, but there are a number of scenarios where the technique is useful. A common application is to change formats from one locale to another. For example, loading a QVD created in Europe (with European formats) and assigning US Date and Number formats. The technique works for any input source; SQL, QVD, xls, etc. It works for both QlikView and Qlik Sense. You may not ever need this tip, but if you do, I hope it saves you some time and makes your coding easier. Want more Tips & Tricks? 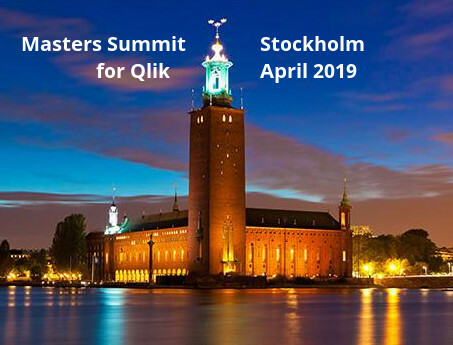 Join me at an upcoming Masters Summit for Qlik event in Johannesburg (6-8 Sept) or Austin (10-12 Oct). In addition to our two days of core sessions, Bill Lay’s “Tips & Tricks” on Day 3 always teaches me something new. 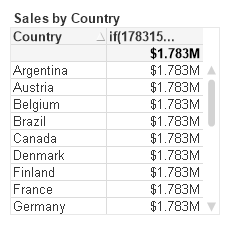 Have you noticed something new in QlikView12 and Qlik Sense timestamp parsing? UTC timestamps are automatically understood. That is, the UTC offset of “-0500” is detected and the returned value is the UTC time, not the local time of 2:25:23 PM. I can’t find anything in the help beyond an example for Timestamp# that demonstrates this but provides no detail. This parsing functionality is particularly useful now that the QlikView Server logfiles use the UTC format for times. I’m not sure yet if I like the automatic conversion to UTC time. For example, apps like the QlikView Governance Dashboard now report Session Start or Event times in UTC time, not local time. Summary: QV12 introduces a “breaking change” in how file paths are interpreted by QVD File functions like QvdNoOfRecords. In QlikView version 11 script, the five QVD file functions were not impacted by use of the Directory statement. Relative paths given to these functions were always relative to the qvw file, not the current Directory setting. This is different than the other file functions like FileSize() which considered paths to be relative to the current Directory setting. 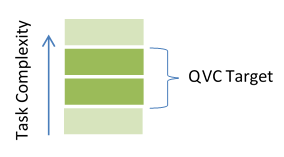 In QlikView version 12, the QVD File functions have been changed to respect the Directory setting, making them consistent with the other functions. I think this is a good idea. However, it is a breaking change in that your QV11 script may no longer work in QV12 without changes. This will not work in QV12. The function will be looking for the qvd in “data\data\Customer.qvd”. There will be no script error, but the value of “vCustomerRows” will be null. Because QV12 respects the Directory, the correct syntax for QV12 would be “QvdNoOfRecords(‘Customer.qvd’). This change is probably not a big deal for most customers, but it could be a silent irritant for many. If your incremental reloads or other conditional code test for the existence of a QVD using QvdCreateTime(), the code could make the wrong decision leading to missing or corrupted data. Next week I’ll show you a simple way to scan all your qvws for use of QVD functions or other script of interest. Summary: QV Version 12 removes per qvw control of the script EXECUTE Statement. In QV12 Server, the default is to disallow all EXECUTE statements. Any EXECUTE statement will fail unless you turn on the global setting to allow. The QlikView script “EXECUTE” statement provides the capability to run external programs from script. Because EXECUTE may present a potential security risk, it’s use must be authorized. QlikView Version 12 changes how EXECUTE authorization is granted. In QV11 Desktop, the script editor Settings pane provides a checkbox labeled “Can Execute External Programs”. This property is set per qvw. When an EXECUTE statement is encountered, execution is allowed if the property is checked. If not checked, a popup is presented asking for permission. The “User Preference: Security: Always Override Security: Script” may be checked on to bypass the Execute permission check. If “Script” is checked, the execute statement will be allowed regardless of the “Can Execute External Programs” setting. Authorizing Execute works differently in QV11 Server reloads. In QV11 Server prior to SR11, Execute statements were always allowed. The “Can Execute External Programs” property has no effect. Setting the value to “0” prohibits Execute in any reload on the server, setting to “1” allows all Execute statements. The default is “1”, allow. The “AllowExecuteCommand” is set in the QVB settings file “C:\Windows\System32\config\systemprofile\AppData\Roaming\QlikTech\QlikViewBatch\settings.ini”. See the SR11 or QV12 Release Notes for more information. To summarize QV11 controls — In desktop, it is possible to control Execute on a qvw by qvw basis. In Server SR10 and earlier, Execute is always allowed. In SR11+, Execute may be allowed or disallowed for all qvws via the “AllowExecuteCommand” setting. On to QV12. In QV12 IR Desktop, the “Can Execute External Programs” checkbox is present but it has no impact on script execution. The only way to allow Execute is to check on the “Always Override Security: Script” User Preference setting. I hope the “Can Execute External Programs” checkbox is removed in a future SR as it no longer seems to have any use. QV12 Server uses the “AllowExecuteCommand” ini setting. The default is “0”, disallow, which is different than QV11. To summarize QV12 controls — In Desktop, Execute is allowed or disallowed for all qvws via the “Always Override Security: Script” User Preference setting. In Server, Execute is allowed or disallowed for all qvws via the “”AllowExecuteCommand” setting. To allow Execute in Qlik Sense, you must enable Legacy mode. Turning on Legacy mode also allows file path references in LOAD statements. I’m guessing most Sense users would not accept this side effect, which may mean that Execute is not practical in the Sense environment. Execute is not a commonly used script statement. If you are using Execute, I hope this post helps you plan for QV12. Learn how to measure and optimize the performance of your QlikView apps. By the end of the session, you will understand how the calculation process in QlikView works, and how data model, expression and chart design impact response times and resource usage. You will come away with the skills to analyze your own apps and make them run faster. Speed up your QlikView™ development workflow by making use of the powerful QlikView Components (QVC) scripting library. Here’s a heads up on a QlikView script syntax issue. The problem came up several times in a beginner class last week and I’ve also noted beginners on the QlikCommunity Forum struggling with this as well. There should be a space after a script keyword, separating it from the next word, right? If we omit the space the syntax coloring will alert us and we may get a red error underline as well. What if a bracket is used, such as the case when a name contains a space? If a bracket appears immediately after the keyword, the syntax highlighter will make look it correct. But it is invalid syntax and will fail when reloaded. There are a number of places in script where this problem can happen. Here are a few examples. Good news! QlikView Version 12 corrects the problem. In QV12, the missing space will be flagged in the editor. While the requirement for a space may seem obvious to an experienced developer or programmer type, it can be a problem for beginners who are copying an example from a book where the space is not so clear, and who rely on highlighting to tell them they have it right. It can be a difficult error to debug. The resulting script error message can be something indirect like “missing/misplaced FROM..” when the actual error is a missing space after an “AS” keyword. [ Single-quote and Double-quote are not delimiters. I know this incomplete, leaving off tabs, newline, =>. Just keeping it simple. On 2 Oct, I was pleased to join a group of eight Qlik Luminaries on a field trip (we had a bus!) to Qlik R&D in Lund, Sweden. Ralf Becher has written a nice overview of the trip here. One outcome of our meeting is a list of enhancements we believe would be valuable additions to QlikView and Qlik Sense. You can view the entire working list here. The list includes quite a few topics. Today I want to focus on improvements to Variables. A common challenge is”script only” variables getting inadvertently promoted to the UI. There is a desire to better control and identify variables in the script. What follows are a number of specific feature improvements for variables raised during the meeting. The general theme is to extend the current management functions for Fields to Variables as well. A HidePrefix and $hidden Tag for Variables. Hidden variables would not appear in the Variable overview or Expression Editor dropdown unless “Show System Variables” was checked. A “DROP VARIABLES vg*” statement. The DROP VARIABLE statement would delete a list of variables from both the script and UI. Script deletion of a UI variable is not possible today. Importantly, the list can include wildcards. Currently the only way to add comments to variables is through the Variable Overview dialog or the VBScript API. Comments are a useful feature and it would be great if comments could be set using script statements. What do you think? Would you use these additions? Are there additional improvements you would suggest for Variables? TLDR: A new Qlik Sense training video uses a tired old-school Master Calendar script. I propose that updated training materials should use an updated script. I just watched a new video by Michael Tarallo of Qlik titled “Understanding the Master Calendar – Qlik Sense and QlikView“. Before I pick on the contents of this particular video, I want to credit Michael for producing many excellent training videos that are worth watching and learning from. I highly recommend them. The video does a great job of explaining the need for and function of a Master Calendar in your data model. It then goes on to show an actual script. On to the script used in this new video. I’ll reproduce the entire script below and then comment on the techniques used and suggest some more “modern” approaches. 1. Why is this field created and where is it used? It’s not used. It’s left over from a very old version of the exercise and it doesn’t serve any purpose. 2. Why are we sorting the table? Is this statement useful? Even if I could think of a good reason why the Calendar table should be in order, it already is in this order because the TempCalendar was generated in a loop. Statement unnecessary. Loading a Resident table can be very slow for a large table. Experienced scripters use the FieldValues array instead. What’s the difference? FieldValues only reads the distinct values of a field — maybe a thousand or so for several years of dates. Resident reads every row of the table. For a 10M row fact table, that’s 10M reads and the time scales up linearly. The difference can be dramatic. Peek(), used on lines 13 & 14, is one of those functions that fails silently. That is, if you misspell a field or table, you won’t get a script error. Misspelling a variable will also not generate a script error. Maybe. Or maybe not. Or maybe you will get a Calendar that starts in year 1899. Depends on which line you make the spelling error on. If your misspelling does result in a script syntax error, it will be downstream from where you created the problem. There are multiple ways to mess this one up and some very curious potential results. Don’t forget to DROP those temp tables on lines 15 and 35. And those varMinDate and varMaxDate variables really should be cleared as well. Nothing to remember (or forget) to clean up. If you misspell a fieldname, you will get an understandable error at the right place. This is the calendar script I wish we would provide to newcomers. Of course if you’ve attended the Masters Summit for QlikView, you’ve learned all about FieldValues, Preceding Loads and more. If not, attend a summit this Fall in NYC or Copenhagen. QVC users don’t even get out of bed to generate Calendars. But they know that all that best practice stuff is happening under the covers. If you want to learn more about QVC, join my online class June 4 or a future class at Q-on.bi. I’ll be leading a 3.5 hour training June 4 on using the free open source “QlikView Components” scripting library. The training is held on-line and you can find out more and register at this link on the Qlik-On website. What was that Set Analysis syntax for month-to-date in the previous year? 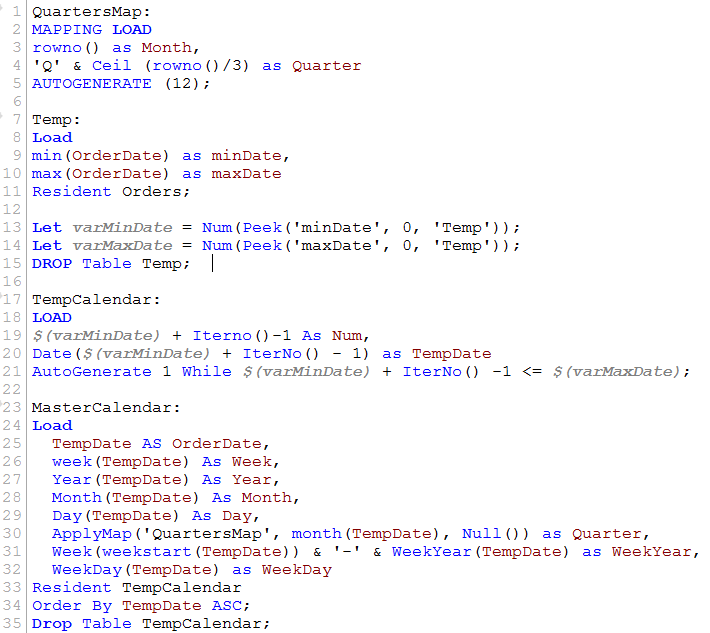 The Calendar generates a series of variables for common period to period analysis. That’s all there is to it. Even if you add fields to the Calendar. Even if you use Italian or Norwegian for the calendar field names. Load variables from an external file. Load custom icons from a folder. Logging, including rolling external files. Pause mid-script and let you inspect the contents of a table. The QVC project was founded in 2012 with the goal of simplifying common scripting tasks and implementing best practices. The focus is on what we call the “big middle” of scripting tasks. The library is continually refined and enhanced with input from QV developers around the world and we expect some exciting new testing routines soon! I hope you can join me June 4 to learn the details of installing and using QVC. You will leave the class with the confidence and skills to use all the QVC routines and begin supercharging your script!